Wine Kloud, the latest entry into the online discount wine sales market, seems like a decent site. It has some weaknesses, which I'll get into, but overall I like its strengths enough to make up for them. What it's good at is offering real wines made by wineries for the general public, unlike the made-to-order concoctions of Naked Wines. Wine Kloud does not sell the wines itself. Instead, a team of blue-fingered elves tirelessly searches the Internet for daily deals from wine retail stores and posts them on the Kloud. That's the idea, anyway. The wines I found on Wine Kloud I could also find on Wine-Searcher, most at similar prices (try that with Naked Wines), although Wine Kloud did have a very few good deals that weren't on Wine-Searcher. Full disclosure: I am the California Editor for Wine-Searcher, so they pay me. Even before that, I was a big fan. Any wine you can think of, if it's for sale at just about any retail store, you can find it on Wine-Searcher and order it from the store that sells it. I have bought some very cool bottles of wine and whiskey that way. What Wine Kloud offers, more than its usually illusory promise of better prices, is a bunch of pictures of labels. Visual suggestions, if you will. The site is lacking in descriptions of the wine, so it's not as novice-friendly as Naked Wines. But if you know wine, it's like browsing a virtual wine store's shelves. Wine-Searcher will find any wine you can think of. Wine Kloud will show you some wines for sale that you might not have thought of, at very good prices, far below suggested retail. Even if they're not always the very best prices in the country, they're very good prices. The sites are best in tandem: find a wine on Wine Kloud, and see if the price really is better there than on Wine-Searcher. There's no substitute for a good local retail wine shop. But when I wrote about the best places to buy wine, I was reminded by some readers that not everyone is lucky enough to live close to one (bad real-estate planning, I say). A site like Wine Kloud is great for people like that: who know wine, like to buy wine, and need a greater selection than their local stores provide. Wine Kloud is the brainchild of two former salespeople from the importer Winebow, a very strong importer of Italian wines that also has its toes in 10 other countries. Darian Wilson, one of Wine Kloud's co-founders, worked with Gary Vaynerchuk at the Wine Library before Winebow, and he told me, "Through working with Gary, I was introduced to the daily deal concept very early and took it upon myself to develop my business based around the daily deal concept. The niche I created for myself was very unique within the industry and is what led me to where I am today." I wondered how Wilson and his partner Rich Martini find the deals on Wine Kloud and that's how I learned about the blue-fingered elves. He has different terminology, but I like my description better. Here's Wilson: "We have an internal team of wine professionals that vet every deal that comes through our door." Yeah, that's the conversation I had. I wouldn't be posting this, though, if I hadn't found a few deals on Wine Kloud with better prices than on Wine-Searcher. I asked Wilson for a list and he gave me several, most of which are behind the $25 (per year) premium access paywall. Exactly two were not. Here's how those worked out. Chateau Belair-Monange Saint-Emilion 2012, Wine Kloud had for $99.99. Best price I saw in the US on Wine-Searcher was $124.94 at JJ Buckley. The Wine Kloud listing is at Bridgehampton, NY store, Sokolin & Co. I call the store and they don't actually have it. Not any vintage. Ignominious start: bait and switch. Wine Kloud, 0 for 1. Chateau Ramafort Medoc 2009, Wine Kloud had for $16.99 from Wine Globe in Milpitas. Best price on Wine-Searcher: $17.91 from a store in Brooklyn. But the Brooklyn store's Product Description says "Not available." Bait and switch is a big problem with online retailers. The next cheapest Chateau Ramafort price on Wine-Searcher is $25.99 from a New York store. So $16.99 would be a nice savings on that price -- if Wine Globe actually has it. And Wine Globe actually apparently does! Wine Kloud, 1 for 2. Those were the only wines cheaper than Wine Searcher last week outside Wine Kloud's Premium Access section, which costs $25 a year. Wilson gave me free Premium access so I could check a few of those deals that he said were cheaper than Wine Searcher. Wine Kloud has Sans Liege "Pickpocket" California Grenache 2011 at $19.99 -- but I find it on Wine-Searcher for $19.98, no premium access required. Wine Kloud, 1 for 3. Wine Kloud has Oakville East Exposure Napa Valley Cabernet 2010 for $49.99. This is a deal; I can't find it for cheaper than $79.99. Except once again, when I check with the Wine Kloud store that's supposed to have it, they do not. Premium bait and switch. You also have the enormous question of why would you want to buy this wine in the first place. I've never heard of Oakville East, and so what if $50 is cheap for a Napa Cabernet; it's not cheap for something that was probably just relabeled bulk juice. Wine Kloud, 1 for 4. But then I have a hit -- an extra-base hit. Wine Kloud has Dauphin de Grand Puy-Ducasse Pauillac 2010 for $29.97. I can't find it cheaper on Wine-Searcher than $49.95. So that's definitely a deal: a Pauillac for $30? And the Wine Kloud store, The Wine Market in Minnesota, apparently actually has it! Wine Kloud, 2 for 5. For baseball fans, it's hitting .400/.400/.800. Then there's Lady Hill Winery Freedom Hill Vineyard Willamette Valley Pinot Noir 2013, on Wine Kloud for $23.99. The store in North Carolina also actually has it. I can almost equal that price on Wine-Searcher; I find it for $27.99 in Portland. But a deal's a deal, and I can see ordering a single-vineyard Willamette Valley Pinot Noir under $25 and seeing what I end up with. Wine Kloud, 3 for 6, which is not terrible, although I must point out these were deals specifically suggested to me by the company founder. I'm not sure I'm willing to recommend Wine Kloud's Premium Access, but to be fair, $25 a year is not that much, and if you really like the Pauillac it would pay for itself in two bottles. How does Wine Kloud make its money? The same way as Google: stores pay to have their deal posted higher up on the page. For what it's worth, the really good deals recommended by Wilson were further down the page. 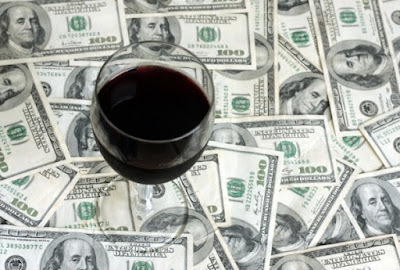 All of that said, if you like buying wine online, I am willing to say check out Wine Kloud. The front page I just clicked on before writing this line had a Premier Cru Chablis from a producer I like for $17.99, a Saint Estephe for $30.99, a Napa Cabernet for $23 and a 2009 Piedmontese Nebbiolo for $11.25. I didn't take the trouble to compare prices with Wine-Searcher to see if I can beat these deals elsewhere, nor did I look into the wines to see whether I'd want them. But all four of those sound tempting at those prices, right? If nothing else, a look at Wine Kloud's deal page will make you thirsty. Wine Kloud's page is here. I wish I could say tell 'em I sent you and I get a nickel, but, sigh, nope. But hey, try the Wine-Searcher link while you're here. Subjecting a wine to the vagaries (abuses) of cross country ground transportation just to save a few bucks might not be in a wine buyer's "enlightened self-interest." A long distance wine buyer doesn't know the ambient temperature in the cargo hold area of the package service truck picking up from the wine store, or the ambient temperature in the cargo hold area of the package service truck delivering to your front door. If it's just saving a few bucks, might not be worth it. But what if it's more than that, and perhaps even finding you can't find it anywhere else? Something to consider at that point. And I've had that happen to a few bottles that I've looked for, although they were quite lesser known CA producers, so almost expected. Although I'll grant you, I got it via GSO next day from a shop up in Nor Cal.